School: Pacific Beach Middle School-6th grade; 3.6 GPA! 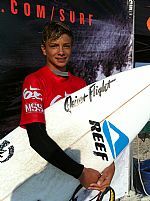 Claim to Fame: Ryland pulled out all the stops at the Seaside Reef Open not only taking his first Open victory of the season in the talented Boys division, but advancing all the way to the semi-finals of the hotly contested Juniors U16 category. The 12-year-old rising up-and-comer from Pacific Beach enjoys stepping up his game in the upper age bracket "because I learn more from the older surfers and it pushes me to surf better." He has also been dominating the Explorer Menehuenes winning 3 straight contests! Claim to Fame: Frankie enjoyed another incredible contest weekend posting up 4 more wins but this was the most impressive thus far. 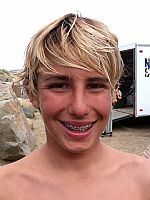 In pumping conditions in the frigid waters of Pleasure Point & Steamer Lane for the NW Conference events 2 & 3, the 13-year-old female phenom was charging. Her crisp backside attack on the 4-6 foot rights at Pleasure Point was sharp but it was her performance in hefty 6-8 foot surf at the Lane where she made an enormous statement scoring a perfect 10 on a heavy Middle Peak bomb! Claim to Fame: This is huge! 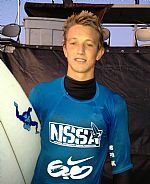 NSSA surfer Noah Flegel was named the 2011 Sports Illustrated Sportskid of the Year. Noah who competes in the Southeast Conference, is also sitting on top of the wakeboarding world. This year he won the 14 & under division at the International Wakeboard Championships, the World Wakeboard Association’s World Championships and National Championships. Noah’s equally impressive in the classroom, where he maintains a 3.5 GPA. Check Noah out on the cover of the December issue of SIKids! Claim to Fame: Tommy had a gigantic weekend at the Gold Coast doubleheader at Ventura Harbor. In the Super Grom division, the 10-year-up and comer scored double wins shredding the fun 2-4 foot wedgy peaks. Tommy was practicing at the Harbor the entire week prior to the contest and his hard work clearly paid off. In addition, he stepped up in the 12 & under Menehuene division and made both finals! 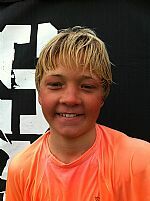 Tommy has also been sharpening his skills by competing with the top kids in the SW Open Boys & Mini Grom divisions! Claim to Fame: Dax is leading the new generation of young, talented female Hawaiian rippers. The nation witnessed her amazing potential when she crushed the competition in the Open Girls division at the 2011 Nationals winning her first title. In the 11/12 Hawaii season, her skill level continues to soar. 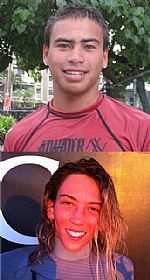 At Hawaii event #7 on Nov. 5 at Banyans, Dax made a huge statement with a triple victory sweep in Open Womens, Open Girls & Explorer Girls. No doubt she will again be a major National title contender in 2012! Claim to Fame: Jack raised eyebrows with his outstanding performance in the Mens division at the SW Newport Open. 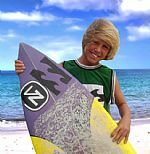 In classic Newps conditions with 3-5 foot "A" frames pumping through the 54th St. lineup, Jack opened up the first heat of the contest pulling into a grinding left tube, pig-dogging his way to a 9.5 score. Minutes later the HBHS Surf Team Captain was off to take his SAT's. After finishing the test, he was back in the water winning his 2nd round heat! He ultimately advanced to the final placing 3rd! 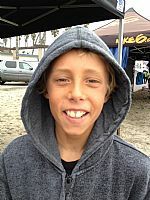 Claim to Fame: Crosby earned his first NSSA victory in the Super Groms at the SW Explorer at Mission Beach. The younger brother of NSSA standout Griffin Colapinto, Crosby has been watching and learning from his brother while working hard competing in both Open & Explorer events. In the Super Grom final, he got into a good rhythm right off the bat opening up with a 4.5 and then nailed the win with a good 6.5 score, which was the best wave of the final. "It's the best feeling, getting my first win!" Crosby said. 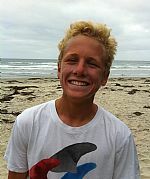 Claim to Fame: Wow, what a red-hot performance Eithan put on at the SW Oceanside Open! The 11-year-old stepped up big-time with his first Open win in the Boys. But what really caught everyone's eye was his huge 2nd place finish against the heavy hitters in the Open Juniors. Eithan found his rhythm right off the bat winning his 1st round in Juniors and never let up earning 5 heat wins. "It's amazingly awesome!" Eithan said as he was greeted with high 5's & pats on the back from everyone on the beach! Sponsors: Billabong, Von Zipper, Perfection Surfboards, Village Surf Shop, Surf Water Promotions. Claim to Fame: There's a new East Coast hot grom on the rise by the name of Micha Cantor! Micha marched into the first contest of the 11/12 Mid Atlantic Season at Nags Head and put on a powerhouse performance scoring triple victories in the Open Boys, Mini Groms & the Explorer Menehuene. Micha didn't have to look far for great role models as his local surf spot at Garden City Pier is the same as National Champion Cam Richards & his brother Cole. Congrats to Micha for ripping to 3 wins in his first NSSA event! Sponsors: RVCA, Nixon, Channel Islands Surf Shop. 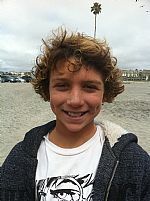 Claim to Fame: Davis cashed in on his 5-hour trek up to Morro Bay for Northwest Conference opening day on October 9th with a big victory in the hotly contested Open Juniors division. The Huntington Beach High School freshman was red hot in the chilly 3-4 foot running lefthanders of the Rock, unloading solid carves and crisp vert turns heat after heat. He had a perfect run winning every round en route to his impressive triumph in the final which will put him on top of the leaderboard in the NW Juniors ratings! Sponsors: Sector 9, Daphnes California Greek, Dakine, Marko Foam, Bubble Gum Surf Wax, NewKreation Surfboards, Quiver, SurfCo Hawaii, Aerial 7 Headphone, PacSun USA Surf Team Member. Claim to Fame: Kulia has busted out of the gates this season as one of top Women's surfers in the NSSA. This past weekend at the Upper Trestles Open, the talented 15-year-old crushed the competition sealing her second straight victory in the Women's division while building a substantial lead in the ratings. She's been working hard to improve her game in all conditions, getting her boards dialed and it's definitely showing in her heats. She is hungry and determined to bring a National title home in 2012! 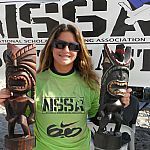 Claim to Fame: Tatiana was raising the bar at the NSSA Hawaii event #4 at Lahaina Harbor. In perfect 2-3 foot conditions, the reigning National Explorer Girls Champion was putting on an electrifying surfing display dropping excellent 8 and 9 wave scores with ease en route to scoring double victories in the Open and Explorer Womens finals. Tatiana has already proven she can win at the National level and will certainly be one of the top Hawaii prospects to take the premier National Open Women's title in 2012! Claim to Fame: Jake & Nick are quickly emerging as the dynamic brother duo this season! 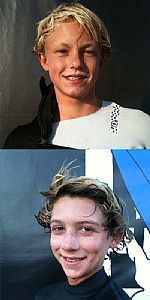 Both bros put up stellar performances at the SW Explorer at Crystal Pier this past weekend. Jake, who is the reigning Open Boys and Explorer Menehuene National Champion blew doors taking double wins in the Boys & Juniors divisions. Younger brother Nick took command of the Super Groms posting his first perfect 10, scoring the highest heat total of the event & winning his second straight which gives him a solid ratings lead! Claim to Fame: Brogie has been on fire in the opening events of the 11/12 SW Open Season. Things are clicking for the flashy 14-year-old who's been pushing the level. He took 2nd in the OSide opener last week and then finally broke the ice nailing his first SW Open victory in the Juniors final at HB Pier. Meanwhile 3,000 miles west another bright star is making waves from HI. 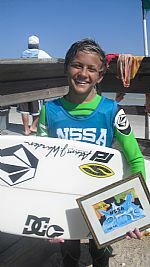 Cole put on an terrific performance at the NSSA HI Lahaina contest sealing his first win in Super Groms and placing 2nd in Mini Groms! Claim to Fame: Thelen & Griffin busted out of the gates with flying colors at the SW Open Season opener at Oceanside Jetty. In an array of conditions ranging from challenging, chunky overhead walls to glassy head high peelers, both surfers delivered "suitable for framing" performances. Definitely nobody saw this coming when Griffin who is in his 1st year of Juniors, exploded to a runner up showing in the premier Open Mens division while Thelen blew up in the Juniors final winning it on a clutch buzzer beater! Hometown: Newport Beach, California with deep roots in Santa Cruz! Sponsors: Quiksilver, Super, Sanuk, Freeline, Oakley, HDX, Ocean & Earth, Futures. Claim to Fame: John came out swinging in his first appearance of the 2011-12 season. At Gold Coast opening weekend at Mandalay, John took double wins in the Boys & Menehuene divisions in event 1. The next day in event 2, he claimed another victory in the Menehuenes. 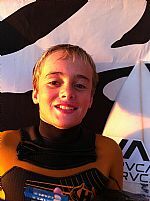 The 2010 National Mini Grom Champ also earned the only perfect 10 of the comp in his Menehuene semi in event 1. 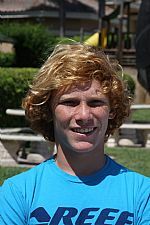 With many surfers aging out of the U13 categories this year, John is on track to be a leading contender for championship titles in 2012! Claim to Fame: There is no better way to kick off the season than to claim your first ever victory and this is exactly what Brett did! 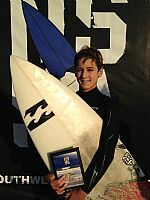 At the SW Explorer opener in HB, Brett was on fire in the Menehuene final ripping the fun 2-3 foot peaks. It's obvious that the 12-year-old from Encinitas put in a lot of practice over the summer surfing his local spots Seaside and D Street. "9th St breaks a lot like D St," he said. "I'm really excited to get my first win and already looking forward to the next Explorer!" Claim to Fame: Brianna is another young, rising female emerging out of Kauai's hotbed of talent. 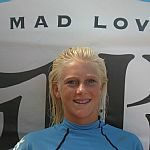 We witnessed Brianna pushing her level at the 2010 Nationals when she placed 2nd to fellow Kauai native Leila Hurst in the Explorer Womens final. Just missing out on a finals berth at the 2011 Nationals, she is more determined than ever to make a statement in 2012. She has already started putting the pedal to the medal in the new season scoring double wins in the Open & Explorer Womens at Hawaii event #3 at PK's. Claim to Fame: The 2011/12 Hawaii season is off and running and Mahina wasted no time getting off to a fast start. At the PK's event on Kauai last weekend, the 2010 National Explorer Girls Champ was killing it in the fun 2-3 foot conditions scoring double victories in the Open and Explorer Girls. Mahina, who was a standout at the 2011 Nationals making three finals including her impressive 3rd place finish in the premier Open Womens division will clearly continue to be one of the top women's players this year. Sponsors: Reef, Arnette, OAM, Super Surfboards, Surfride and Rockstar. 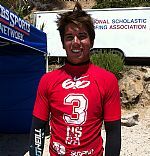 Claim to Fame: Brent captured his second National Interscholastic title winning the College Mens division of the 2011 National College Championships at Salt Creek this past weekend. 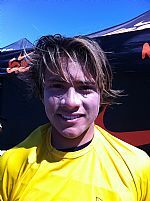 In 2008, Brent won the High School Mens for Carlsbad and now a student at Mira Costa College, his 1st place finish in the College Mens also helped lead the team to its 3rd National Championship title. In a field of over 150 competitors, Brent took command in every heat with an explosive frontside attack on the pumping Creek lefts. 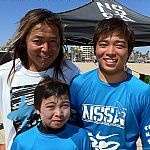 Claim to Fame: The Kobayashi clan took command at the Family Affair contest in 2-3 foot fun waves in HB. In an awesome fun-filled event for families to enjoy competition and a day at the beach, the Kobayashis were in a fantastic rhythm. 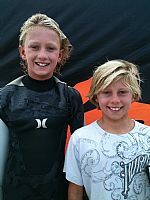 Masaki and Shaw claimed the victory in the Open Parent/Kid division over former NSSA standout Ted Robinson and his son Jordan. In the Brother/Brother division, Shaw and younger brother Kei took the win in a tight heat over the powerhouse brother duo of Mike and Terry Gillard. 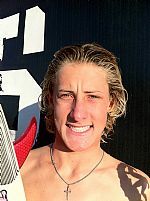 Claim to Fame: After a hard-fought neck & neck battle with Taylor Clark, Breyden claimed the SW Conference Explorer Juniors crown at the Pacific Beach season finale. 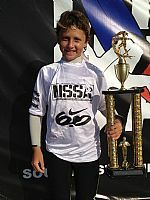 With back-to-back victories at events #7 & #8 at San Clemente Pier to help him on his title quest, Breyden was amped to bag his first NSSA title. "It's been a long season," he said. "It came down to the final event with Taylor and me and I'm stoked to have come out on top!" Next week, Breyden will be on the hunt for his first Regional title! Claim to Fame: Nic was in red-hot form at his home break at Pleasure Pt taking both the Mens and Juniors victories in the Northwest Open. In terrific, warm spring conditions with glassy, chest to shoulder high running righthanders, Nic unleashed explosive turns and big carves heat after heat and was duly rewarded with 7, 8 & 9-point rides. The double wins should give the 14-year-old huge momentum as he sets his sights on the upcoming West Coast Championships where he will seek his first Regional title. 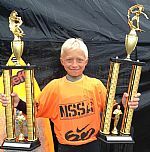 Claim to Fame: In one of the most thrilling, closely fought and attention-grabbing races in Southwest Conference history, Griffin clinched the 2010-11 Open Boys conference title over 12 & under competitive standout Jake Marshall. Griffin and Jake have been going head-to-head this season pushing the highest level and raising the bar contest after contest. They both came into the season finale at Oceanside this weekend with four wins apiece and it was Griffin's third place in the final that sealed the deal. Sponsors: Quiet Flight surfboards shaper Bruce Ragan, Atlantic Photo, Reef, Electric, and West Wetsuits. Claim to Fame: At the 2011 East Coast Championships there was a new sheriff in town by the name of Daniel Glenn. 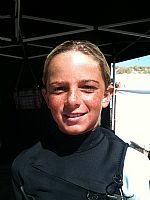 The 14-year-old blew up in his local waters putting on a spectacular performance winning every heat in both the Explorer Boys and Open Juniors. His first Regional Championship victory in Explorer Boys was impressive enough but when he stepped up to the plate and nailed his second win in the premier Open Juniors division it was clear we had witnessed our newest red-hot talent coming out of the east! Claim to Fame: Finn is one of the hottest groms to emerge out of the Islands. 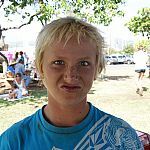 He went ballistic at the Hawaii Regional Championships with double victories in the Open Mini Groms and Explorer Super Groms. 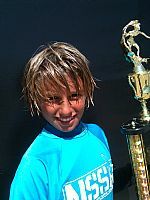 He will be the #1 ranked Hawaii Mini Grom and Super Grom going into the 2011 Nationals. After his Regionals sweep, the talented 10-year-old will now focus on claiming his first National title. Clearly after his outstanding performance at Regionals, he has the potential of taking home Nationals gold! School: Shorecliffs Middle School-8th grade; 4.0 GPA! 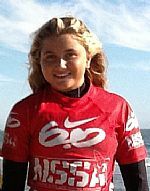 Claim to Fame: Tia has been on a tear for the past two weekends in NSSA comp. 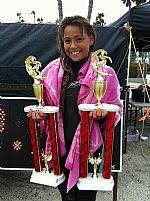 At the 2011 State Championships at HB Pier, she won her first NSSA championship winning the Middle School Girls State Title. Her momenturm continued at the SW Explorer this past weekend where she charged the challenging conditions at San Clemente Pier. Tia battled the heavy currents and ripped the overhead wind swept peaks in both the Women's and Girls divisions claiming double victories! She also shreds in school with a 4.0 GPA! Claim to Fame: Micky is the newest hot grom coming out of our Gold Coast territory. Last December, he had a break out event at the C-Street contest where he claimed his first NSSA victory in the Menehuenes. But it was this past weekend at Pismo where Micky made a giant statement. In good chest to head high surf for the GC event, he made double finals taking 3rd in the Menehuenes and stepped up to an impressive 4th place in the Boys. The following day in Northwest comp, he sealed his first Open win in the Boys! Sponsors: Volcom, DC Shoes, Prolite,Smith Optisc, Superbrand, Nixon. Claim to Fame: Noah cleaned house this season in the Southeast/North Conference. He basically took command of the ratings in three divisions, Open Mens, Open Juniors. & Explorer Juniors. The defending East Coast Open Juniors Champ swept Conference titles in all three divisions while chalking up 10 victories to close out the SE/N regular season. Noah will now focus on defending his Regional title this April in his home turf at NSB and then hope to make a statement at the Nationals. This kid's talent is legit! Claim to Fame: Jeremy had a breakout contest in the biggest way celebrating his first win of the season at the SW Explorer at La Jolla Shores. Not only did he break the ice with the victory in the Mens final, but he did it convincingly combo-ing the field. In small, challenging waves, Jeremy surfed fast and light. He pulled out his bag of tricks launching a clean air reverse which wowed the crowd and lit up the scoreboard with an 8.8 out of 10. He ripped another little right earning a 5.0 to seal the deal. Claim to Fame: Looks like we have a new female ripper opening up some eyes on the east coast! Amanda has made the trek from the frigid waters of New York to surf in the SE Conference and she's already taking home some serious hardware. Competing in the Open Girls, Womens & Explorer Girls she has claimed 3 victories & 2 second places in two events. Amanda has a great attitude and is focused on improving her skills. Her goals for this year are to get a good result at the East Coast Champs and make the Nationals! Age: 10 but going to turn 11 on 1/26! Claim to Fame: Conditions were about as good as it gets for stop #8 of the SW Open at Salt Creek. In amazing overhead surf, light offshore winds and summer-like temps, the Mini Grom kids were having a field day and performing at inspiring levels. Mini Grom ratings leader and Newport's latest surfing prodigy Tyler Gunter was unstoppable ripping the long steep running lefts with big turns and progressive moves for a Grom! The victory was his 5th of the year. He also took an impressive 3rd place in the Boys! Claim to Fame: It was an amazing contest weekend as mother nature offered up a big dose of surf on all coasts for the NSSA! In pumping 6 foot waves at Banyans on the Big Island, Matty was pushing the power envelope taking the win in the Explorer Juniors & runner up finishes in the Open and Exp. Mens. Meanwhile 3,000 miles east in clean 3-5 foot surf at the Encinitas Explorer, Jay was having a breakout contest. He went to town in his Boys semi & final ripping 7 and 8-point rides sealing his first NSSA victory!